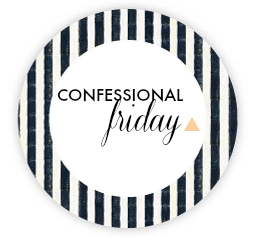 Confessional Friday | life is craigcellent! Today I’m linking up (for the very first time!) with one of my fav blogs, A Blonde Ambition, for Confessional Friday! Yay! 1) I confess that I used to silently judge ladies who wore leggings as pants, but since I’ve been pregnant I’ve done it several times. They’re just so darn comfortable! 3) I confess that I can’t stop listening to the song Fancy by Iggy Azalea. It’s so catchy! 4) I confess that I still have no idea what baby Craig’s nursery is going to look like. I keep changing my mind – ah! I’m seriously going to buckle down and be decisive this weekend. Speaking of….Cheers to the weekend!